Hello Pam! No need to apologize! Ayurveda teaches us that life goes in cycles, some are up times, some down. I also have depression and (anxiety) and can understand the challenges. Welcome to the team, ladies!! Very late to you, Julee; and, I am sorry. No excuse except that life, my numerous health issues, family issues, depression related to, and exacerbated by, the other issues have knocked me down and threatened to bury me over the last several months--much worse the past 2 months. I need to regain control, stop the downward spiral and start taking steps up ward again! Return to Rural, I have added you as a Co-Leader of this team! I am grateful to have you join and be interested in all things Ayurveda, the team, and getting us going again. Maybe you are just the "Spark" that I needed! I truly look forward to getting to know you and being able to brainstorm and come up with ideas to energize the team! Julee, I hope that you and some of the previous members are still out there and still interested in Ayurveda and will jump on board with us. I appreciate your interest and patience so much! Excellence is the result of caring more than others think wise, risking more than others think safe, dreaming more than others think practical, and expecting more than others think possible. I'm new to SP and new to this group. I have been learning about Ayurveda for the past couple years. I hope to find some new friends who are also interested in Ayurveda. I noticed that the team leader hasn't posted anything in a while so I submitted a co-leader request. Maybe we can get things moving here again? There's certainly a lot to talk about when it comes to Ayurveda! I am here and very interested in this team! I want to make ayurveda part of my life but am confused on where to begin. “We can evolve while still staying true to who we are. We can honor who we've been and choose who we want to be next." I am still out here in the fringes...and very interested in Ayurveda. Obviously have not been here for my teams the past several months. Is anyone still interested in this team? Would anyone like to be a Co-Leader to help get it up and going and infused with some new energy? Or, should we let the team pass on in peace? I see you are the Team Leader now, Pam. This journey into Ayurvedic concepts is one I am interested in. Thank you for keeping this Team going. Hello! Hope you all are well and getting very knowledgeable about the wonders of Ayurveda! I have a number of issues going on in my life and with my health and they all came crashing in on me a few weeks ago...not an excuse, just a confession...so I haven't been able mentally/emotionally to be here. I just logged in and did spin the wheel, tracked foods and steps a few days... I'm trying to find my way back into the light now! Don't give up on this team either! I am certainly not an expert on Ayurveda--trying to learn and incorporate all that I can into my life...I hope you will continue the journey with me! the only thing you can't do ....is what you dont think you can do!!!!!. I am happy that you found it helpful! Namaste! Pam... thanks so much for all the info. I found some good stuff from your links! Happy Saturday! Re-posting a message I had posted in a couple of other teams...not an Ayurveda 101; but, some places to start! The book that I am currently reading is "Ayurveda The Science of Self-Healing" by Dr. Vasant Lad. I purchased this one thru Amazon. Dr. Lad is the founder of the Ayurvedic Institute in Albuquerque, NM. The Institute’s website is: www.ayurveda.com . They also have a store, offer seminars, etc. in addition to the school. Dr. Lad has numerous books in print as well. I do believe that Ayurveda is something worth learning about and trying; it definitely addresses mind, body and soul/spirit, and has been around for thousands of years! I think that is a great idea!! I wonder if our Team Leader is here? I am new too.... to the team and ayurveda. I’m still learning and eating different. I love what it's doing to my body in many ways. Hope the team keeps going, would be nice to share recipes in subcategories of doshas?? 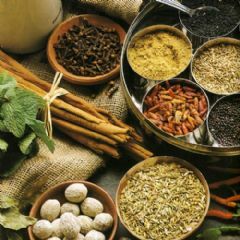 Ayurveda helps me with food cravings or "lack of" I should say! I have been wondering that too!LOL! The Team idea is great, and I am interested, but I have not seen much team activity. I do hope that things start popping soon! LOL!